Adult Children Living at Home: Good or Bad? If you’re out of college and living at home, there’s a very real possibility that you may feel like the world’s biggest loser. It’s not socially acceptable by a large portion of the population to be living at home after graduating from college. You’re supposed to be an adult, which means living on your own. But graduates these days are leaving college with more than $35K in student loans. How exactly are you supposed to pay off your college loans, pay for an apartment, pay for living expenses – a cell phone, groceries, gas, and a car – all while holding down that entry-level job that barely pays above minimum wage? Are we leading the next generation to believe in a financially unrealistic, and frankly, unattainable American dream? And then we get mad if they rack up credit card debt! Here’s why adult children living at home is okay, and often, a necessity. Perhaps my opinion comes from a very biased perspective, since I moved back home after college and lived with my parents for three years. Living in a high cost of living area, finding my own place was completely unrealistic. I was making $13 an hour, and after taxes, health insurance, and my 401k contribution were taken out of my paycheck, I was raking in about $1,600 net a month. A one-bedroom in my area was going for about $1,200 at the time. How was I supposed to pay for food? How was I supposed to live? I also needed a car to get to and from this $13 an hour job, which required a car payment (it’s not like I had thousands lying around to buy a car straight out of college! ), car insurance, gas, and regular maintenance. 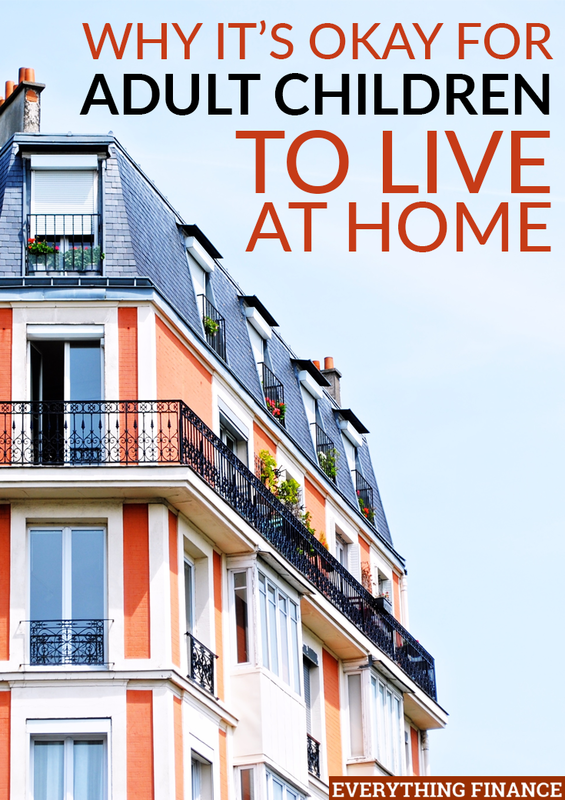 Living at home allowed me to learn how much life can truly cost without the financial burden. I learned to budget unbelievably hard during those three years I lived at home—because I wanted nothing more than to be able to afford to move out. I learned how to save a large chunk of my money, and how to balance saving and spending. But I wasn’t the only one who benefited from my time living at home. During the recession in 2009, my mom lost her job. My parents, who had always been a dual-income household, were now relying solely on my father’s income. Having me at home was an extra safety net for my parents. From the moment I moved back home, I paid my parents a minimal amount in rent. It wasn’t enough to cause me financial distress, but it was enough that it hurt to lose that money. Yet, it also helped my parents out financially. Parents seem to be very vocal about whether they want their children to live at home or not. Some parents would love to have their children back at home, and others are ready to take back their house for themselves as they gear up for retirement. You have to really look into your own family dynamics and financial situation to see if having adult children living at home makes sense for you. For my parents and I, it was the best decision, and it ended up teaching me financial responsibility, which helped me manage my money later on. Did you move back in with your parents after college – or at any point? Are you a parent who would be willing to allow their children back home? Or are you against it from either side?